The first time we meet, I will want to hear what your goals are in our work together. I will help you to find your voice in its most authentic expression and develop your individual style. My intention is to help you develop the courage and confidence to access and release the full range of your emotional/vocal potential. You are your voice, so we will be working with your body and your emotions, your will and your intellect. At your consultation, I would like to hear what you feel your strengths and weaknesses are and we will discuss how we can work with both. Whether you are a complete beginner, have professional aspirations or therapeutic goals, I only ask that you commit to your journey as much as I will. EFT (Emotional Freedom Technique) the Sophia School of Living Arts, Austin, Texas. Wave Form - a way of using specific receptors of the nervous system to identify where change 'wants' or is ready to take place. "Jenna is an inspirational teacher and we feel so lucky to have found her to sing with our 7 year old daughter. Her lessons are bursting with soul and creativity and it is a joy to watch our daughter develop and thrive with Jenna." Clare & Rob T, Rose's parents. 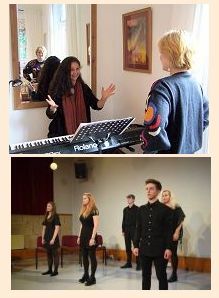 "Jenna's teaching has transformed my singing. She is professional, positive and encouraging. Her focus on a really good technique has enabled me to take on repertoire I'd have previously thought impossible. Highly recommended." Sylvia Wilson, vet.